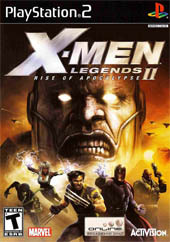 The sequel to the best-selling X-Men title ever, X-Men Legends , X-Men Legends II: Rise of Apocalypse is an all new action-RPG that lets players create, customize and control teams of four mutants from 16 all-time favorite X-Men and classic Brotherhood villains from the Marvel Universe. 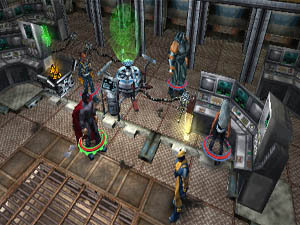 With the X-Men and Brotherhood fighting side by side for the first time, players switch instantly between teammates wielding many more super powers and skills than X-Men Legends , as they overcome obstacles, solve puzzles and defeat more than 100 types of enemies including Lady Deathstrike and the notorious Four Horsemen of Apocalypse. X-Men Legends 2: Rise of Apocalypse is the sequel to the highly popular game X-Men Legends that once again reunites gamers with the Marvel universe and those uncanny X-men. The story begins with the X-Men and their arch-enemies, the Brotherhood, teaming up to foil the plans of Apocalypse. Apocalypse has devised a plan to use the mutant powers of four X-Men to make himself unstoppable. Once again it’s up to the X-Men to put a halt to Apocalypse nefarious schemes. The control system and playability is similar to the previous title with the gamer controlling four heroes at any one time, although you only actually 'control' one of them. As you move through maze-like dungeons, er… sewers… tons of bad guys hurl themselves in your direction, ready to be mowed like a mutant lawn. Each character has default melee attacks that can be strung into short combos as well as a long list of “mutant powers” that they can unlock and unleash as they gain experience points. With over twenty powers per character and eighteen total characters to choose from, that’s a lot super heroes from the Marvel universe. As with all good RPG titles, your characters must level up when they acquire enough experience points and you can distribute stat points, skill points, and equipment for your team, but keeping more than four mutants adequately equipped is unfortunately sometimes extremely tedious. Thankfully, the game includes an “auto-distribute” function that makes sure each character is wearing what they should be and spending skill points wisely. Still, you want to have some control over which skills are being boosted, even as you might grow tired of dressing them and wiping their drool-covered chins. Graphically, X-Men Legends 2: Rise of Apocalypse features some great cel-shaded graphics that really blends with the comic book perfectly. The backgrounds and environments are varse and interesting that almost mirror real-world cities with lush detail and a great colour palette. When things are really flying around, mutants firing away, and me calling for help or complaining about my lack of power, the framerate can dip quite a bit. 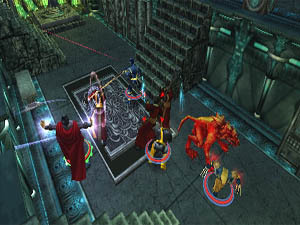 In conclusion, X-Men Legends II: Rise of Apocalypse is a worthy sequel to the original game and although it’s as far as a D&D game as possible (graphically and with content), in actual fact, it’s just your stock standard D&D game that is set in modern times with super-heroes, not that this is a bad thing but it’s just different. A great little RPG that I would recommend to all lovers of the Marvel and RPG universe.